Smooth loading, durable and secure, the SunPort2™ provides a unique combination of form and function to your PWC docking experience. The wide-mouthed pivoting tail guides and holds the bow upon entry and enables loading on the port with minimal power; and the integrated bow stop positions your craft properly, protecting it from dock accidents. A hydrodynamically shaped bottom helps keep your craft floating horizontal on the port and uniquely-shaped, dual row of Stoltz rollers are designed to provide the best fit for your craft, with the most durability. Foam-filled polyethylene construction makes the SunPort2™ unsinkable, giving you additional piece of mind. Smooth loading, safe drive-on port designed for salt or fresh water with any fluctuation. The Slide mount is designed for non-floating docks that have fluctuation of water depth. Corrosion resistant aluminum pipe brackets are stylish and durable. The optional multi-port connector attaches multiple SunPort2™ together. 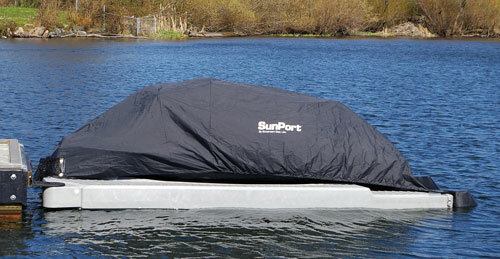 The Sunstream DuraflexxTM system is a set of rubber mounts that attach the SunPort2TM to a floating dock. The elastomeric design is very durable and reduces stresses on the port and dock. The SunPort2™ enables a hassle-free docking and launching experience, and the optional QuickCover™ makes covering your craft easy and quick, completing the ultimate PWC storage system. The front of the cover is attached to the bow stop, and the rear of the cover simply clips on to the rear corners of the SunPort2. A net on the bow stop stores the cover when not in use.